5 grain levain #2 (see the community bake here) except this time i've swapped the bread flour for whole-wheat and vice versa. Works very well and it's more wholesome. Original dough was sticky, due to the add-ins, and decided it could cope with just a straight swap. 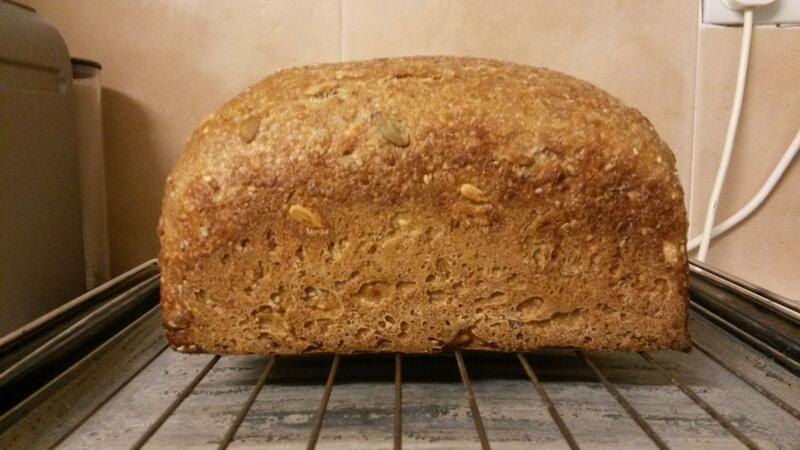 For the soaker this time we have cracked rye, rolled barley, linseed, sunflower, pumpkin and sesame. Method was the same with an overnight final proof. Baked in a pullman. I've baked this one for the freezer. Arriving States side tomorrow and this loaf is for when I get back. How did the dough feel with the change? Do you feel a pan is needed for this flour version? If you haven’t done so already you could post a link from the CB to here. Others viewing that link in the future might be interested. The loaf looks very nice. It will be nutritious and should taste great! Abe, your pan looks like a 4”x8”. Is that correct? What is the weight of your dough? This is exactly half the recipe of the original spreadsheet. Identical to my original 5 grain levain apart from swapping the bread flour and whole wheat around (in the levain too) and using cracked rye. The feel of the dough was the same at first but after the stretch and fold it had absorbed a tad more of the water. Not that much difference though. Slight difference in the height but from the outside very similar. Dough weight was 1063g and it was this pullman loaf pan. For a mostly white loaf the size of the dough was almost perfect for the pullman (perhaps it needed 50g more dough) and for this wholegrain version I reckon 100g more. This one looks fantastic and has to be even more tasty! Bet the crumb comes out nice too! Well done and happy baking. You are right Dabs. I am baking a 2lb + loaf and there's still room for more. I've checked the lakeland site and this pan only comes in two sizes. A 0.5lb and a 1lb pan. I definitely chose the 1lb pan and from the start I noticed it's deceptively big. When I come to bake a rye in this pullman I'm thinking I'm going to need closer to a 3lb dough. You did bake a rye loaf in that pan, didn't you? How much dough was that? It does seem a bit strange that the 1 kilo of dough looks so comfy in a 1-pound pan. But it looks like it works a treat! Ok, so what is going on? The loaf is beautifully golden brown! A beauty! Give or take a few millimeters. So that measures up. Now I'm confused as this clearly fits a 2lb loaf of more! BTW... The recipe that came with the pullman had 500g flour + 350g water + oil + salt + yeast. Well that's already over 1lb. the first loaf, since you had 850g of dough for a pan that was ostensibly for 450g. Weird. Can't complain. I'm getting 2lb loaves. Those measurements definitely equate to a volume that is for 2lbs. No doubt about it. What are Lakeland on?? A mistake for sure! Tempted to buy that tin now... Gives more bread than expected! A lovely gift and it works so well. Fitting in a larger dough size is a good mistake. Treat yourself. I might just do that Abe. Looking at the measurements again this tin seems too large for 1lb but then a little too small for 2lbs. A white dough made with 454g of flour would work though. My current 2lb loaf tin is approx. 11.5cm x 11.5cm x 25cm and holds 3.3 litres of water. Which means the white bread dough should weigh 2300/1.925 = 1.195 g and the rye dough would weigh 2300/1.6 = 1438 g .
You can do the same thong for a pan without a lid. All you have to do is add 10% - 12% to the final number to account for how high above the rim you want it to bake in the end. I'm getting close but want it exact. Thank you! And that came to around 850g. Could easily have doubled that for a rye. I think this is a 2lb loaf. You will be happy to return hom to that loaf.... I know I would be. Have a safe trip, Abe. Nice to know I won't have to bake something as soon as I arrive and can take it easy till the weekend. Just fed my starter. The most important job before going away. Next most important thing is to make sure I don't forget my passport. ... 1 pound of flour? Is 2lb. I'm beginning to think 1lb flour or a typo.